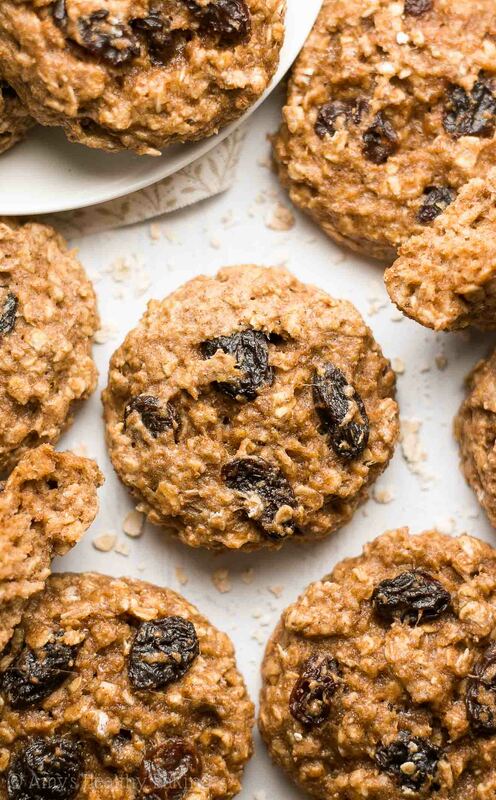 An easy recipe for oatmeal cookies that are healthy enough for breakfast! Made with no butter, refined flour or sugar & only 82 calories! Before and after our Disney parade, we got to spend the rest of the day going on rides! And since the park coordinator typically scheduled us in the late afternoon time slot on New Year’s Day, we nearly had all of Disneyland to ourselves in the morning because most of the world was sleeping in from staying up until midnight and ushering in the new year. To prevent the trip from becoming too expensive, our band director booked a huge block of rooms at a budget-friendly hotel about a mile away from Disneyland. As part of the package, he and the hotel manager set up a big buffet-style breakfast for us in a cavernous meeting room, rather than the hotel’s restaurant. With 250+ students and parent volunteers, we would’ve scared off the rest of the hotel patrons from the lobby’s tiny dining area! Back then, I rarely thought about healthy New Year’s Resolutions (unlike this year, when I started this program! I hope you join me! ), so I actually treated that buffet breakfast as a special occasion and loaded my plate with some of my favorite treats like waffles, French toast, donuts, or mini muffins… Plus a side of fruit, just to be safe! But instead, I decided to compromise with these Healthy Oatmeal Raisin Breakfast Cookies! 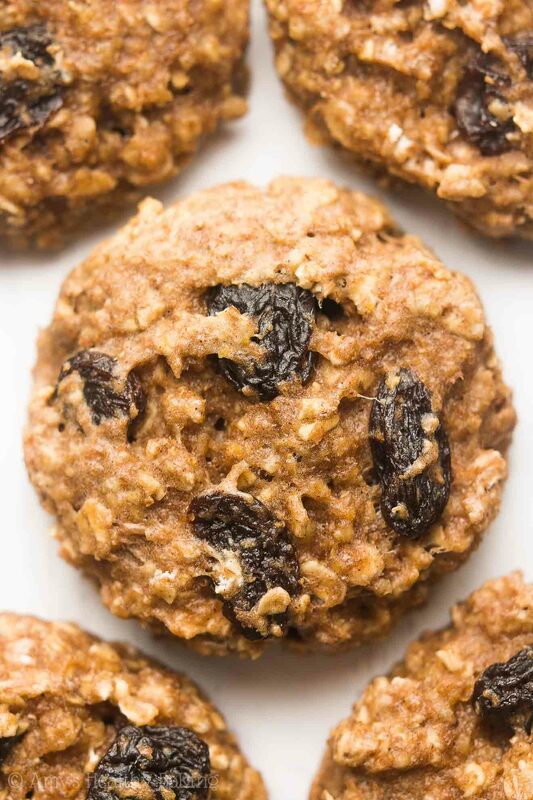 They’re made with entirely wholesome ingredients and just as chewy as traditional cookies, but they’re just 82 calories! Making it perfectly reasonable to sneak a second, right? ? Just like the others, this recipe starts with whole wheat flour (or gluten-free!) and instant oats. 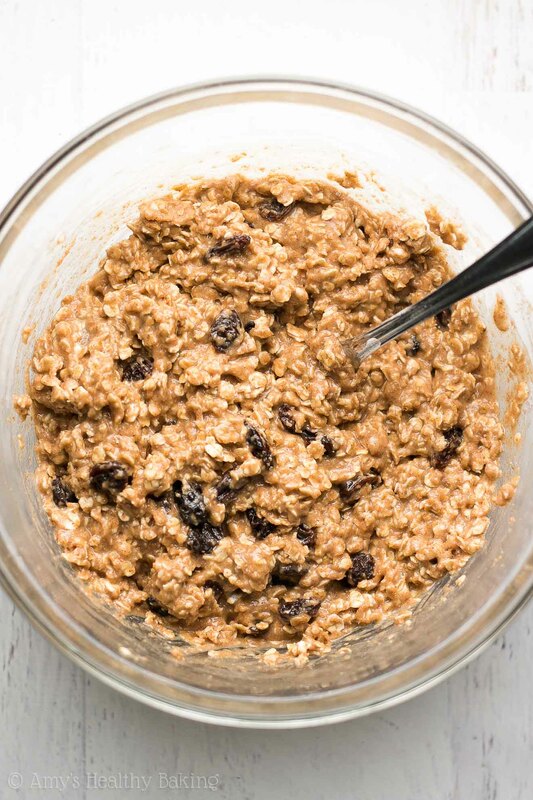 Instant oats are also called “quick-cooking” or “one-minute” oats, and they’re sold in canisters right next to the regular old-fashioned oats at the grocery store. It’s extremely important to measure the flour and oats correctly, using this method or a kitchen scale. 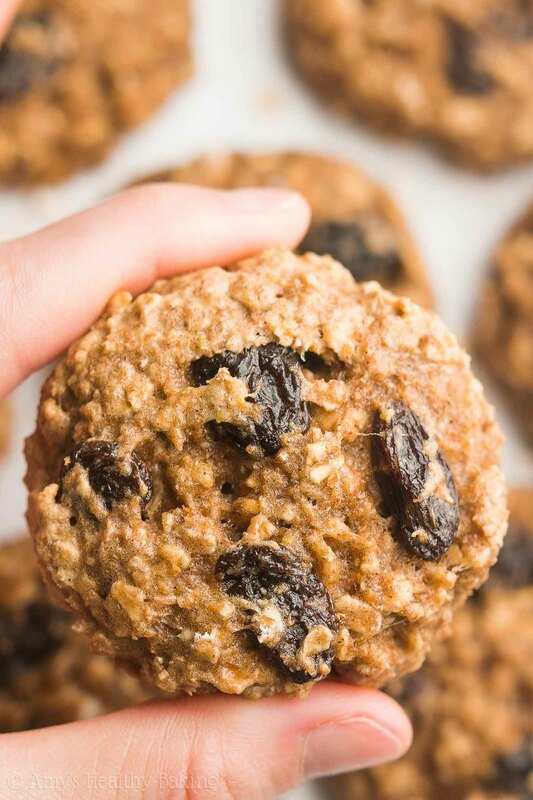 The oats act like little sponges and soak up moisture from your cookie dough, so too many will make your cookies taste cakey or dry! That’s why I highly recommend a kitchen scale. This is the one I own, and it has been the best $20 I’ve ever spent! I use it to make every recipe I publish here on my blog because it ensures they turn out with the perfect taste and texture every time. 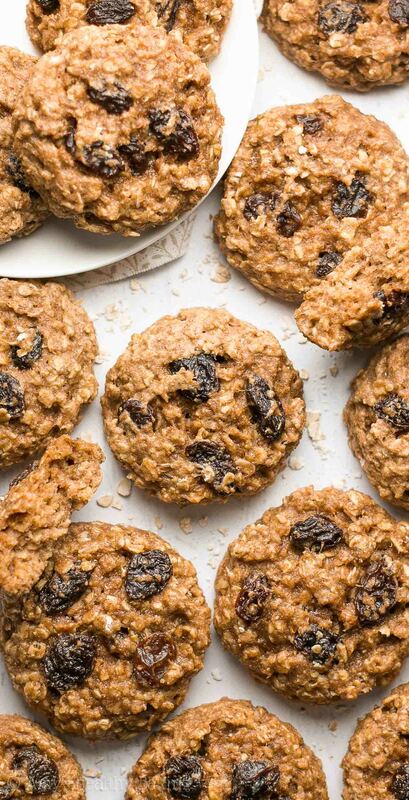 Instead of refined sugar, you’ll sweeten these cookies with pure maple syrup. Make sure you buy the good kind! Avoid pancake syrups or sugar-free syrups because those contain corn syrup or artificial ingredients, which we’re avoiding in this healthier recipe. The only ingredient on the label should be “maple syrup.” It generally comes in thin glass bottles or squat plastic jugs, and you can also buy it here for a slightly discounted price! Since you’ll use about half as much sweetener as typical cookies, you’ll also add in milk to compensate for the missing volume. (Less sweetener = why they’re healthy enough for breakfast!) Any type of milk will do! Time for a healthy breakfast! ? And when you make your own, remember to snap a picture and share it on Instagram using #amyshealthybaking and tagging @amyshealthybaking IN the photo itself! (That guarantees I’ll see your picture! ?) I’d love to see your cookies and feature them in my Sunday Spotlight series! These are a cookie lover’s dream come true! 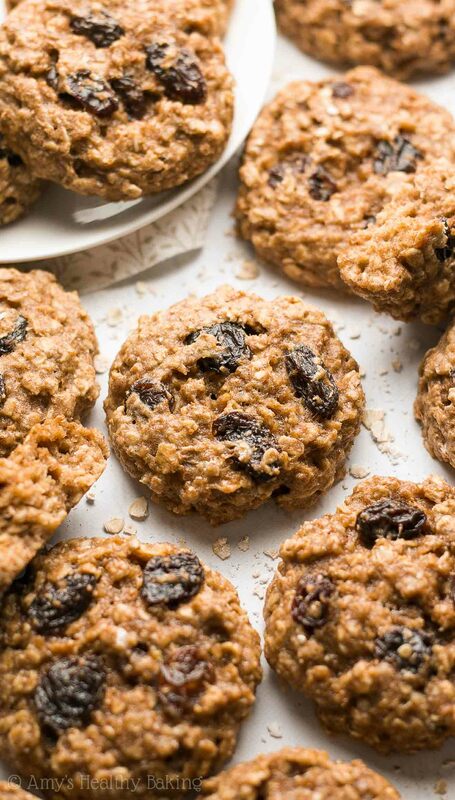 They’re just as chewy as traditional oatmeal cookies, and they taste just as cozy and delicious, too. They’ll keep for at least a week if stored in an airtight container—if not longer! In a medium bowl, whisk together the oats, flour, baking powder, cinnamon, and salt. In a separate bowl, whisk together the coconut oil, egg, and vanilla. Stir in the maple syrup and milk. Add in the flour mixture, stirring just until incorporated. Gently fold in the raisins. Chill the cookie dough for 30 minutes. Drop the cookie dough into 15 rounded scoops onto the prepared sheet, and flatten to the desired thickness and width with a spatula. Bake at 325°F for 10-13 minutes. Cool on the pan for 10 minutes before transferring to a wire rack. Notes: It’s extremely important to measure both the oats and flour correctly using this method or a kitchen scale. Too much of either will dry out the cookies and leave them crumbly instead of chewy. For a gluten-free version, use gluten-free instant oats and the following gluten-free flour blend: ½ cup (60g) millet flour, 2 tablespoons (15g) tapioca flour, 2 tablespoons (15g) brown rice flour, and ½ teaspoon xanthan gum. Most store-bought gluten-free blends will work as well, if measured like this. Any milk will work in place of the non-fat milk. For more tips and answers to all other questions, including substitutions and videos, see my Oatmeal Cookie FAQ page. 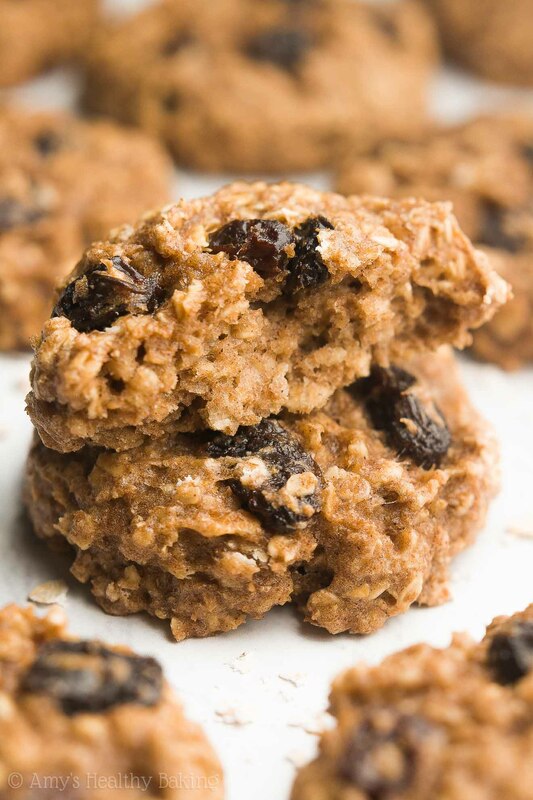 ♥ …and all of Amy’s healthy oatmeal cookie recipes! « Introducing… The Healthy Jumpstart! Happy New Year!? That’s so cool that you were in a marching band, Amy! What instrument did/do you play? These cookies look scrumptious – a perfect treat to start 2017! Thank you so much Katie! 🙂 I played woodwinds! Mainly flue (and piccolo when forced), then I added alto and bari sax, along with oboe and English horn. I also played piano, but only on my own and not in band! Were you in marching band, or do you play any instruments? That’s amazing! You’re very musical then! I also am passionate about music, and I play drums, piano and guitar (that is, when I’m not baking)?. Although I haven’t ever been in a marching band, it sounds really interesting – especially the style of drumming used in marching bands, which sounds so powerful and rhythmic! That’s so great Katie!! I always wanted to learn how to play the drums and guitar… I even contemplated picking up my mom’s old guitar to learn! What musical genres do you prefer playing? I was very reluctant at first when I decided to learn how to play guitar, as I thought I couldn’t do it! But through watching YouTube videos and practising chords, I soon got used to it – I know you could too, if you decided to give it a go some time!? I am by no means particularly skilled at guitar, but I just love playing it. Some friends of mine are brilliant at electric guitar, and some time ago we formed a band! We meet up every so often to practise, and mainly do rock or jazz songs (and I often take some baked goods down with me to hand out, of course)! What are your favourite music genres? I love having music playing while I’m baking too Katie!! I usually say that rap is just poetry set to a beat… Not exactly music to an ex-musician like me! 😉 And I adore movie soundtracks too! I was wondering, should we keep them in the fridge or not? Thanks a bunch for this great recipe! Thanks for your recipe. i tried baking these cookies but my cookies remained soft even after cooling them down in the oven. I had used flax eggs as suggested instead of egg. and honey instead of maple syrup. Can you help me with a solution ? Where do I find nutritional facts about the cookies? I have athletic kiddos that need protein and carbs. Thank you. It’s directly underneath the recipe! 🙂 I can’t wait to hear what you and your kids think of these cookies Meg! Always looking for healthier cookie options, especially using oatmeal, but this recipe was quite disappointing. Followed recipe exactly and cookies are very dry, thick and way too much cinnamon! Thanks for your reply. I measured using a scale (grams) as I always do when baking. I think the problem may have been the oats. I did not have quick cooking oats and measured a cup of regular oats and then processed in Cuisinart. Perhaps I should have processed them first and then weighed? My pleasure, Nora! The oats will weigh the same regardless of whether you process them before or after weighing. Did you make any other substitutes to the ingredients, including the ones listed in the Notes section underneath the Instructions? No, I made no other substitutions. Thanks for the recipe ! Add chia seeds be added to this recipe ?